The iconic Domaine Tempier has been an active family run farm since 1834 and was given to “Lulu” Tempier and Lucien Peyraud in 1936 as a gift from Lucie’s father. Thanks to Lucien’s dedication in helping revive the Mourvedre grape, Bandol is often cited as being a “grand cru of Provence”. 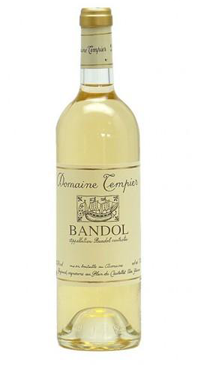 White wine accounts for just 3% of Domaine Tempier’s total wine production. It is made from grapes grown on the estate’s finest vineyards which benefit from limited exposure to sunshine. This results in the grapes ripening slowly which allows the wine to mature with good balance after spending 8 to 10 months in oak casks. A blend of Clairette, Bourboulenc and Ugni Blanc; characterized by minerality, freshness, citrus fruit white blossoms. This white can be enjoyed now and up to 8 years from the vintage should you wish to experience the wine as it develops in bottle.